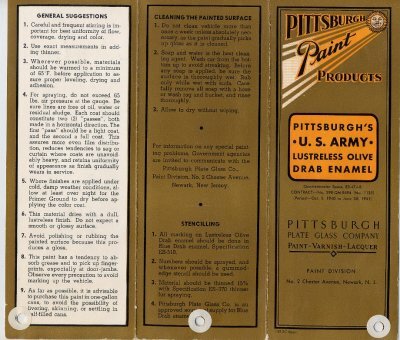 After seeing the above paint chart, two readers ended up sending me samples of paint purported to match the WWII olive drab, lustreless paint. The first sample came from David at Weebee webbbing ( www.odcloth.com ) painted on wood by Russell Axxe (original provider of the brochure above). Some may “pooh-pooh” any evidence presented on wood. Mike Rogers came to the rescue with a sample painted on metal that had been primered. First let me be the first to say that scanning in objects and then presenting them on a monitor is a less than perfect way to do a comparison. But the e-version in my estimation is close enough to the real version for demonstration purposes. In the picture below the base sample is the sample from Mike. 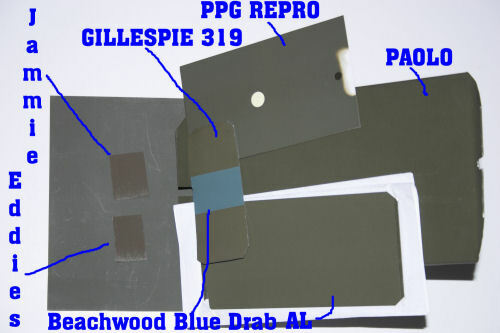 The smaller sample (toward the bottom of the picture ) is of Gillespie 319 as painted by Brother Callahan of Georgia. 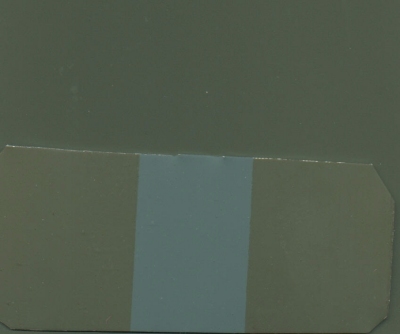 It also has a sample of Blue Drab lustreless paint. Click for larger version. Well, you can see that the new paint is a few shades darker. It is somewhat pleasing. However at its’ current cost of $125/gal vs. $25/gal plus that it is not yet a direct match of the WW2 paint — I believe you should give it a pass. Hopefully, Jim Gilmore will unlock the secrets for us in some upcoming experiments. As usual with jeeps and jeep history…stay tuned! 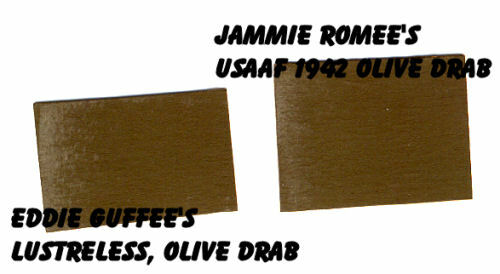 Jammie Romee was kind enough to send to comparative samples of some of his paint, a USAAF 1942 olive drab and Eddie Guffee’s lustreless, olive drab paint. Of course, a scan doesn’t do these justice but the paints are visually identical. The originals are not as brown as portrayed here. They also have the same amount of roughness to them. Now if we could only get this stuff made! This time I have added a photograph of the various samples that have generously been given to me from all over the world. The latest edition piece is from AL in New Zealand. Click on the photo for a larger version. The sample under the Eddie and Jammie paint sample was from Mike Rogers. An explanation for the color variance in parts or vehicles was found in FM 5-20H, July 1944, entitled,”Camouflage Materials and Manufacturing Techniques”. Originals were printed with color charts and photos. The example found was sadly a black and white copy. From the above referenced manual, Section 1. Paragraph 5, PAINTS. (e). …”In spite of color standardization, there is considerable variation in hue between lots and between the products of different manufacturers.” So there you go. 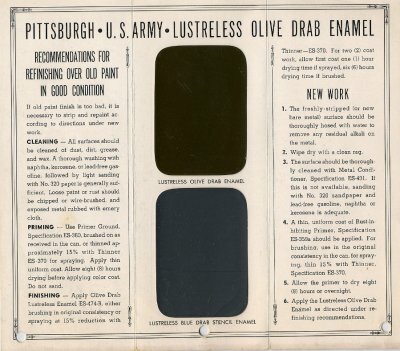 A sane and written (in the period under discussion) explanation of why we find different “hues” of lustreless olive drab. Perhaps we are another step closer in discovering what lustreless, olive drab looked like but it would appear that finding a one true color is an impossible “holy grail”. Comparison to WW2 paint samples taken from sealed cans is perhaps the final test awaiting. Since my last update to this page, TM9 Ordance Products has come out with paints use the same 1940’s technology. The colors look very good. Price is a factor as well to consider. The 1940’s based paint is less expensive but will not last as long TM9 more modern based paints. You must remember that the original paint was meant to last only about a year. The amount of particular matter added to the paint to aid in camouflage caused it to easily deteriate. For example if you rub original paint with your finger you would leave a mark. Very much rubbing and the painted surface will actually begin to shine!